Eureka was known as the Tobacco Plains and was originally home to the Kootenai Indians. The northern section of US Highway 93 was originally an Indian trail and was later used by fur traders and pack trains for travel between Missoula and Vancouver, B.C. David Thompson was the first white man to see the area in 1808. Homesteaders began to come in the 1880s. The first buildings were built on the banks of the Tobacco River. In 1923 a large sawmill, which supported the town's economy burnt down. Since then the area has become a great supplier of Christmas trees. This area offers some of the state's scenic treasures tucked away in Montana's northwest corner. Tobacco River Campground is located adjacent to the Tobacco River in a natural forested area. It is also in the vicinity of 90-mile-long Lake Koocanusa and The Hoodoos, a limestone formation found in an adjoining bay off the lake. 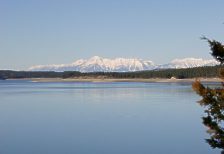 Ten Lakes Scenic Area treats visitors to mountain drives, pristine lakes and abundant fishing. For area history, visit the Tobacco Valley Historical Village. It is a unique collection of buildings and various structures from the 1880s to 1920s. Eureka is also located near Ten Lake Scenic Area of the Kootenai National Forest, which offers more than 89 miles of trails of remote backpacking and hiking opportunities through rugged terrain with spectacular mountain views reaching into Canada. High alpine mountains, cool clear high mountain lakes, peaceful meandering trails, all combine to make Ten Lakes Scenic Area a backpacker's and angler’s delight.